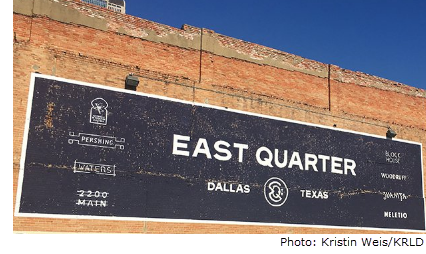 ​​​ DALLAS – Developers are rebranding the historic neighborhood—Deep Ellum—on the east side of the Central Business District as the East Quarter. The name change is part of a redevelopment plan for more than two dozen historic buildings and construction sites along Cesar Chavez Blvd., Commerce St., and Jackson St. Developer Todd Interests unveiled plans for the makeover of 1920s and 1930s buildings at the recent groundbreaking. Todd Interests plans to convert most of the 18 brick commercial buildings into a combination of office and retail space. "This is a neighborhood that's been over 100 years in the making," said Todd. "Some think it's the best-kept secret in our city." All of the construction will be completed by year-end 2018.